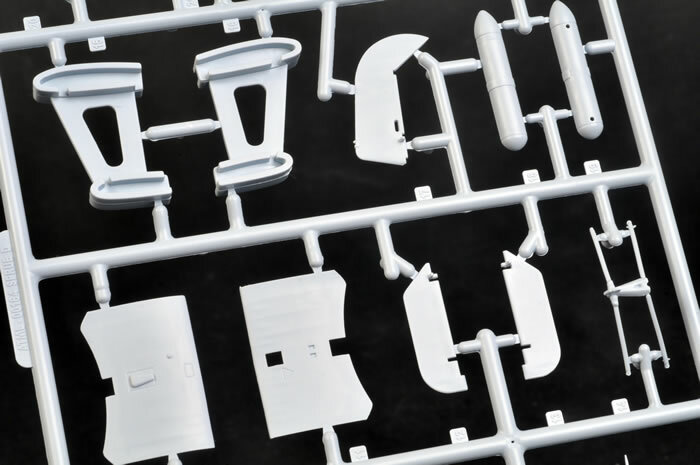 Contents and Media: 123 mid-grey plastic parts on 4 sprues, 5 clear parts on one sprue, decals for 2 aircraft plus an A4 sized 12 page instruction booklet with history, 74 build diagrams and 2 pages of full coloured paint/decal instructions. 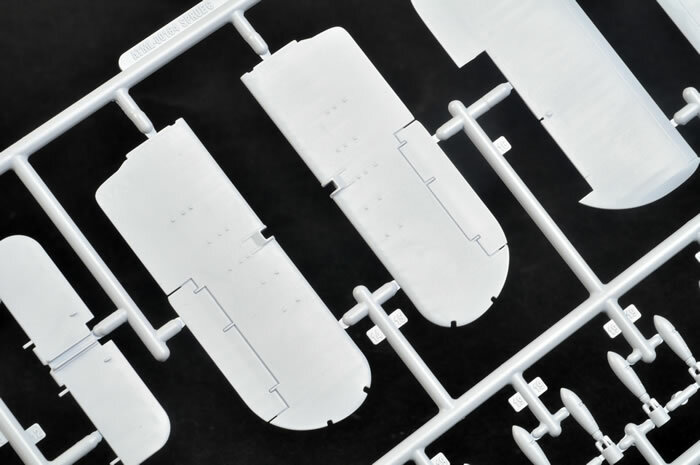 Advantages: Very detailed and accurate, jig for folding wing option and ease of biplane construction. Excellent clear parts and decals. Disadvantages: No parts plan and no rigging diagram. Conclusion: Not only have Airfix given us extreme detail in this model but they have also made an effort to solve the biplane construction problem. 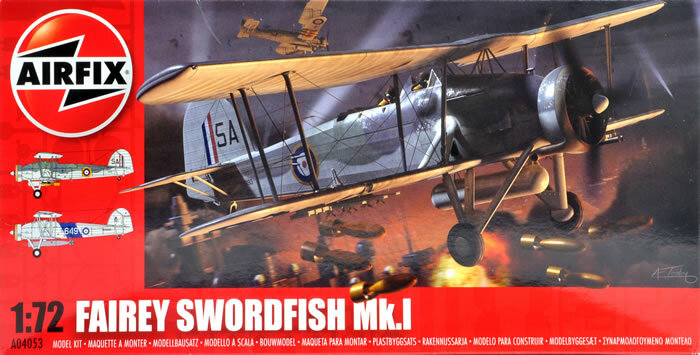 In my opinion, the new breed of Airfix kits just get better and better and I don’t think they can claim this is for the younger (new) generation as the parts count is just too high and yet with the innovations they have introduced with this kit it will not be difficult to build. 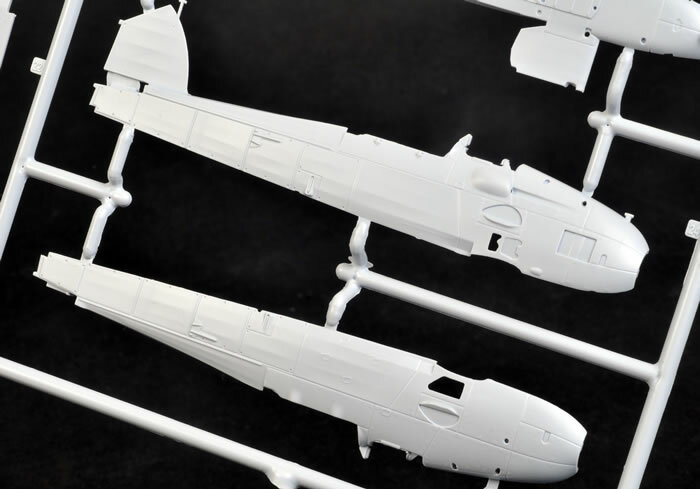 With the same ideas used on other biplane kits, they could just become the 1/72 scale biplane manufacturer of choice. Airfix has delivered a remarkable kit here. It is very well detailed and it is accurate. 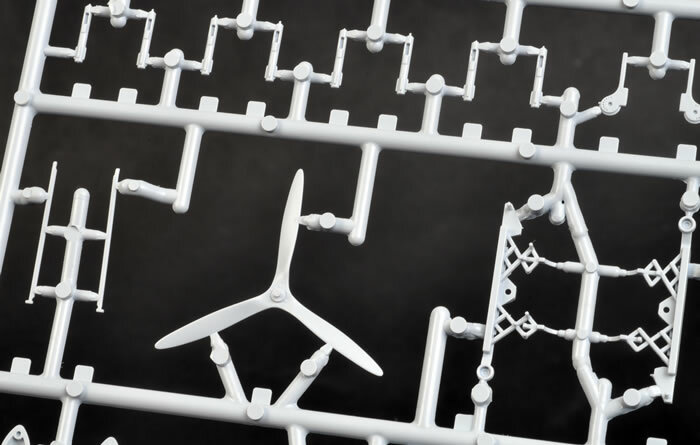 The A sprue contains the three fuselage parts, two engine halves, exhaust ring, the cowling bits, upper wing spar and other small bits and bobs. B has upper wing lower half and lower wing upper half, top and bottom of cockpit, lower stub wing to fuselage supports, torpedo halves plus more small bits. 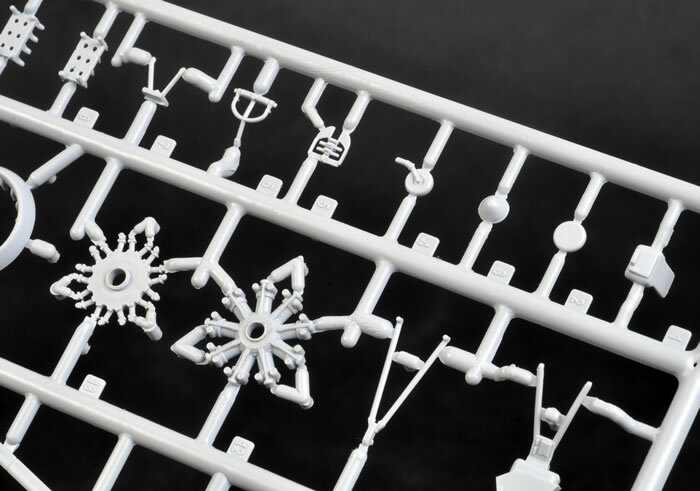 The C sprue has upper wing upper half and lower wing lower half, tail plane, lower wing stub upper halves, bombs and racks, main wheels and again other small bits. 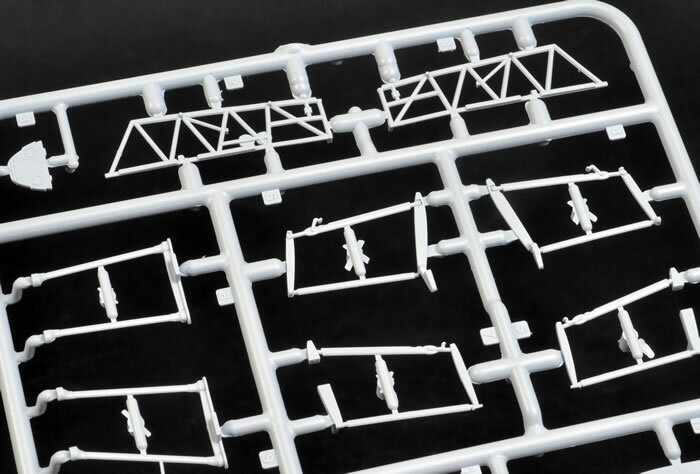 Finally, the D sprue has the cockpit side frames, upper wing centre section, rudder and elevators, prop, torpedo trolley, interplane struts, stub wing jig and yet more small bits. Engine and cockpit detail are excellent. 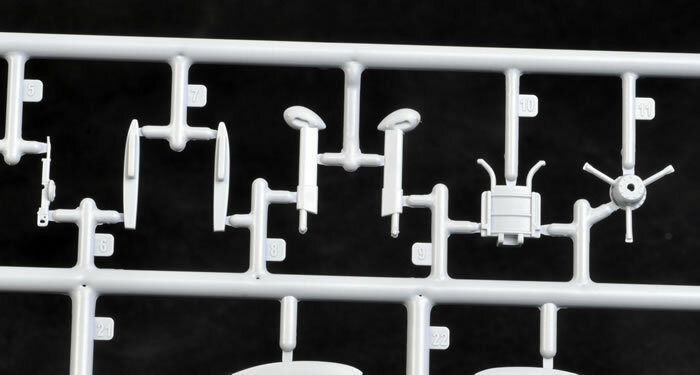 The slightly overdone panel lines are still there and other modellers have opined that some parts are a bit chunky. The wheels look a bit under inflated to me too, but I don’t think any of these cause much of a problem. 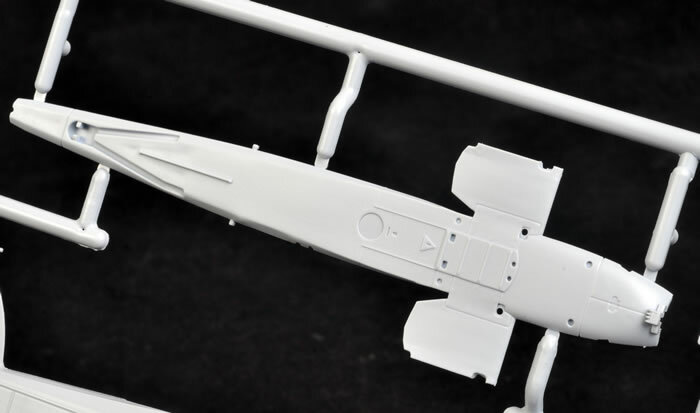 If the modeller wishes to build the kit using the folded wing option, a jig is provided which fits on to the lower wing stub which is part of the lower fuselage moulding and it in turn holds the upper wing stub in the appropriate position above the fuselage. 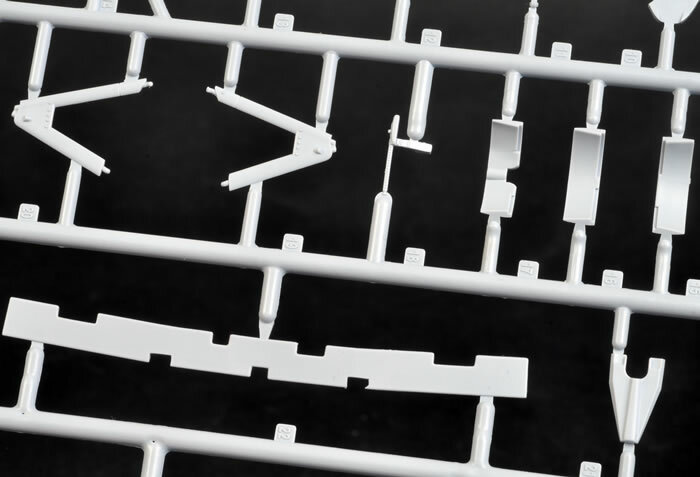 The upper and lower outer wing parts can then be assembled separately using the interplane struts and attached in the folded position. 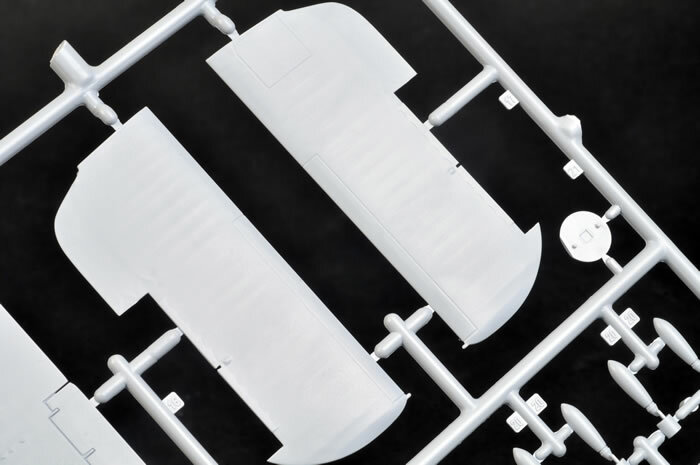 For wings deployed, there is an upper wing spar which joins the centre section, left and right into one piece upper wing to which the lower wings are attached with the use of interplane struts and the whole shebang can then be mounted on the aircraft. This is a fantastic idea and I can’t see any reason why this system could not be used for any biplane kit with a similar jig used on the wing tips of smaller single seat aircraft. 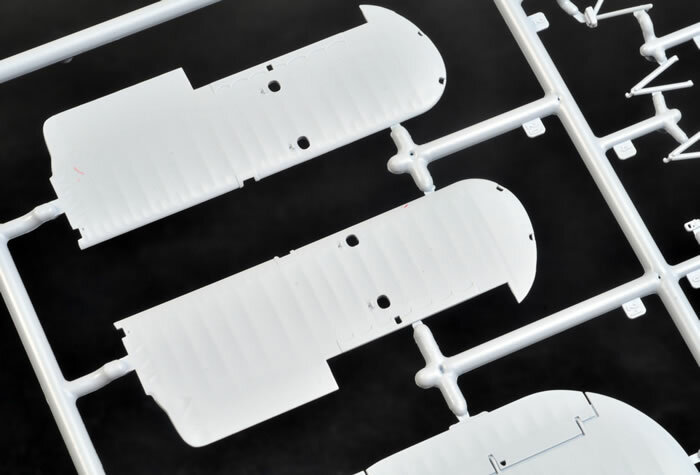 As far as I know, this is the first time a kit manufacturer has made an effort to simplify the mounting of biplane wings since Matchbox tried years ago. 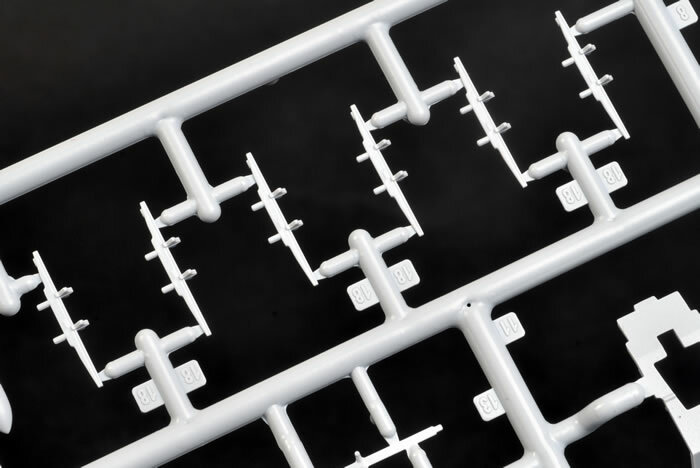 The clear sprue has two side windows, a pilot’s windscreen and two landing lights. These are well moulded and very clear. There are markings for two aircraft - a pre-war Mk.I from No. 820 NAS, HMS Courageous, March 1939 in overall silver and grey with a blue fuselage flash. It carries a practice torpedo. The other is K8393/E5A, No. 824 NAS, HMS Eagle on the Taranto Raid. This aircraft is in the Fleet Air Arm scheme of the time and carries an under fuselage fuel tank and yellow bombs. 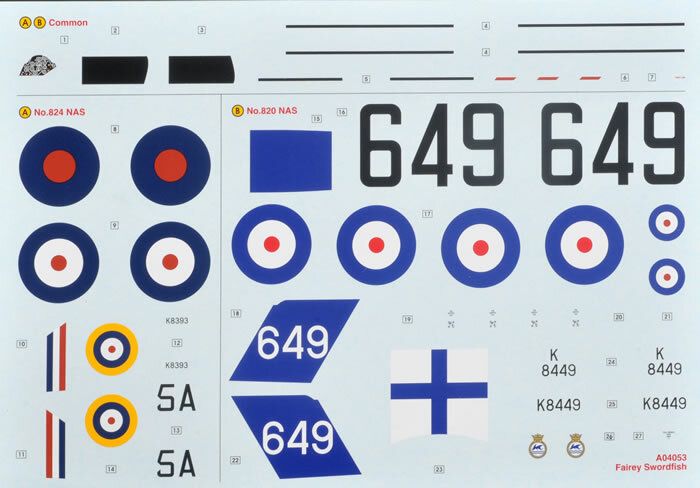 Decals are well printed with all of the marking required for both aircraft. Airfix for some reason doesn’t supply a parts plan nor do they give a rigging diagram although the rigging can be deduced from the box artwork and paint/decal instructions. 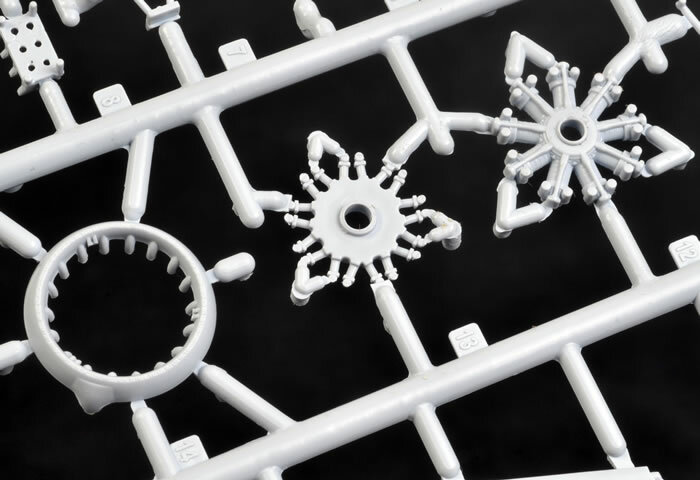 This is a landmark kit as far as Airfix is concerned. Not only have they outdone themselves and most other manufacturers in the level of detail but they have solved the problem of mounting wings on a biplane.